Note: This post does contain affiliate links, which means if you purchase something through one of my links, I may earn a small commission (at no extra cost to you, of course!). It's that time of year again: time to break out the scarves and winter coats and cozy socks. Here in the northern hemisphere, winter is definitely approaching – and so are the holidays. This Friday is Black Friday in the U.S., a day where crazy Americans flock to stores at ridiculous times of day in order to get a jump on Christmas shopping. I actually HATE the idea of Black Friday. But I don't hate sharing gift suggestions. So I'm compromising here. 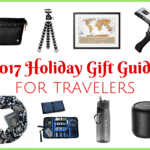 Below you'll find a bunch of cool things that I think any traveler would be excited to receive this year for Christmas. But the good news is you can get all of them online – no Black Friday shopping necessary. For everyone who always asks me what kind of camera I use to take the photos you see on my blog, here's your answer. I recently upgraded my mirrorless system to the Olympus OM-D E-M5 Mark II (a mouthful, I know) along with a . I am LOVING this new camera and lens. The lens is incredibly versatile and sharp, and the camera has just about every setting on it you could need to take fantastic travel shots. It also has a swivel screen, which helps with video, too. If you're looking for a pocketable camera that takes great photos but doesn't cost thousands, the Canon PowerShot S120 is a great bet. The camera is tiny, and yet packs a punch when it comes to options and photo quality. The little camera also has built-in wifi, meaning you can connect it to your smartphone for instant uploads to Facebook or Instagram. These days, many cameras come with built-in wifi to make it easy to transfer photos from your camera to a phone or computer on the go. However, if you camera doesn't have this capability, this SD card will allow you to do it. Slightly more expensive than your average SD card, but the wifi function really is worth it! Protecting a phone from drops and spills is important – it's something I'm always concerned with when traveling. But I'm also always concerned with how quickly my iPhone battery drains when I'm using it to get directions, check email, post photos to Instagram, and use Snapchat on the go. Enter the LifeProof Fre Power case – not only does it protect your phone from water, dust, and falls, but it also acts as an extra battery, meaning you can recharge on the go without carrying any extra wires around. As someone who travels with a lot of tech (camera, lenses, GoPro, laptop, and more), I’m always on the lookout for the *best* carry-on bag/daypack for all my valuable gear. I upgraded to the Camsafe V25 from Pacsafe earlier this year, and have not looked back. This bag has a dedicated section for a camera and lenses, and then a separate section for everything else. It also has all the anti-theft features that Pacsafe is known for like slash-proof material and secure zippers, which draws me to it even more. Having owned two Pacsafe bags in the past, I know the quality of this bag won’t let me down. I SWEAR by packing cubes these days; I basically never go anywhere without them. It doesn’t matter if I’m traveling with a backpack or suitcase, I always organize my bag with packing cubes. By using these, I never have to dig through piles of clothing in my bag in order to find a particular shirt or pair of jeans – I just grab the packing cube of shirts or bottoms, and boom: easy access and no disorganized mess! For a long time, I swore by my HoboRoll – a compartmentalized cylindrical bag with openings at both ends. It was great for packing things like underwear, socks, etc. Now, Gobi Gear has launched the SegSac – like the HoboRoll, but with an opening at just one end. With four internal compartments, this little guy is the perfect complement to my packing cubes. We’ve all experienced questionable sleeping situations on the road. A silk sleep sheet is the answer – it acts like a lightweight sleeping bag, meaning you don’t have to actually touch those sketchy sheets or mattresses, and you can keep cool in any warm-weather camping situations. These also take up virtually NO space in your bag, making it a no-brainer to pack. I’m currently in the very early stages of planning a trip to Africa next year, and this is already on my packing list. One thing I try to do to be kind to the environment when traveling is to take a reusable water bottle with me. But most reusable bottles take up a decent amount of space in a bag. Thankfully, I discovered the Stash by Hydrapak recently, which is a collapsible water bottle that was made for travelers. This one is mostly for the ladies, but I LOVE this map-inspired necklace from ModCloth. I've had this exact piece for more than a year now, and I still get compliments on it every time I wear it. It's a fun and funky piece to add to any wardrobe. Want a way to show off some of your favorite places in the world? These throw pillows by Airportag are perfect. They have dozens of international airports represented, as well as US states and popular travel quotes. They even have “airport codes” for fictional places, like . Airportag also makes shower curtains with airport codes, travel quotes, and even one that looks like a flight board. A shower curtain might seem like kind of a boring gift, but I always used to get comments on my world map shower curtain! If throw pillows aren't your thing, maybe an airport code t-shirt is more your speed. I may or may not have already ordered like three of these from some of my favorite cities in the world! For those of you who would rather show off your US pride, these “home” t-shirts are some of my favorites. They're super soft and 100% made in the USA. AND a portion of their profits is donated to charity. When you’re traveling to multiple countries/continents in the same trip, keeping all those outlet adapters organized can be a pain. Enter this awesome little adapter from Skross. It will work in all corners of the world, AND comes with built-in USB ports. 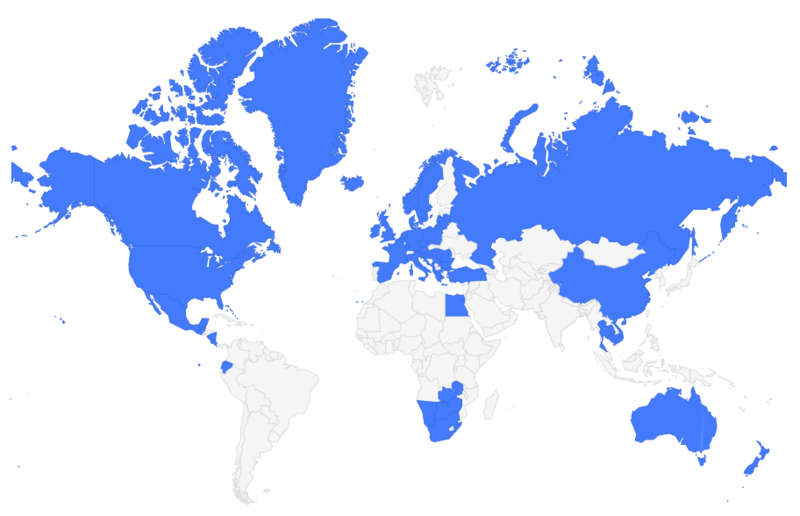 Get a jump on that New Year's resolution you know you'll make about starting a travel blog. Travel Blog Success is the most comprehensive course out there about travel blogging, covering everything from launching a blog to driving traffic to how to eventually monetize it. Joining the course also gets you access to an exclusive Facebook group, which I honestly think is worth the course price in and of itself. If you're beyond the basics when it comes to travel blogging, check out Bloggers, Brands and Tourism Boards: A Guide to Successful Pitching. This course (written by yours truly!) is the next step in treating your blog like a business. The course is filled with in-depth tips, interviews, sample pitches, and more to help prepare you to set up kickass partnerships with travel brands and tourism boards. Curious about how you can go beyond the blog and break into freelance travel writing? Well then Bloggers to Bylines: A Guide to Freelance Writing might be for you. This course covers everything from the writing itself to how to pitch your story ideas to both online and print publications. Which of these would YOU most like to find under the tree on Christmas morning? 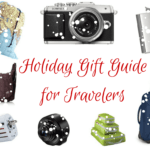 Akatuki's 2014 Holiday Gift Guide for Travelers – PLUS a Giveaway! Loveeee the home t-shirts and I’ll definitely be checking out the Hydrapak bottles. Thanks for sharing, Akatuki! Thanks, Lauren – hope you have a fantastic holiday! 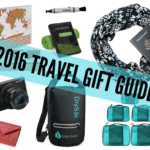 That water bottle is so great to have and so easy to pack…I love it. Ever since I first say you post about packing cubes so long ago I’ve been itching to try them. I would love to get those cubes, or the Olympus camera! You should pick up some packing cubes, then! They’re really affordable and SO useful! Every time I travel I never seem to have room for my water bottle and end up buying yet another plastic bottle when I arrive at my destination (but I do re-fill them on my trip). I’m definitely adding that Hydrapak bottle to my wish list! Thanks for the tip, Akatuki! Yeah, definitely check it out! The only downside is that it has a distinct plastic-y smell at first – you have to wash it out quite a few times! But it’s definitely useful! OMG I know – I want like EVERYthing from that site! Hi! I remember reading that you had an Olympus Pen. I want to buy a new smaller camera now, and I don´t know what to choose: how is the new one that you bought? Is it better than the Pen? The PEN series is still great! But yes, the one I have now is definitely a better camera, especially paired with a great lens! I know, right? Once you discover packing cubes, there’s really no going back! I bought the power strip after I saw it on one of your other posts, and it has been such a lifesaver! It’s great to be able to plug in everything that needs charging in one place, especially when outlets are limited. YES! That item is one that’s so small (and so inexpensive), that a lot of people don’t even think much about it. But it literally goes on EVERY trip with me, and always comes in handy! Chime on the power adapter and power strip. I’ve seen sockets set further back in the wall outlet which can be annoying if you’re plugging in your adapter. There are a number of stores opening on Thanksgiving evening. I don’t “get” that. Yeah, Europe is pretty notorious for that! Luckily the Skross adapter bears this in mind, and the adapter plug fits perfectly into those recessed outlets! I like the pillows and the mugs as they’re small and squishy enough to travel with lol! That camera backpack is pretty nice! Yeah it is! And pretty comfortable, too, considering how much you can pack into it! I had one of the silk sleep sacks when I studied in and traveled around Europe in college. It was a great gift from my mom! Barely took up any room in my backpack and was so comfortable. That phone case looks awesome, too. Great list! Such a little thing, but really can come in handy! I just saw this post now and would love to buy the Travel Blog Success program, but it’s so expensive! Do you know if they will be having any other sales? I’m bummed I missed the one for black friday!